This past February was one of the coldest one I've been through. Damp and dry alternating, one day it was 6 degree, another 16. I felt sick and my skin felt the same too. A lot of the nights - and days - I couldn't stand to finish all the skin care steps, and I just slapped on either an oil, or a cream, after a hot shower, and ran into bed. To be frank, I haven't been the most diligent at skin-caring for a while recently, but thanks to the decent products in service currently, my skin is in acceptable condition. One of them is the face cream I'll talk about today. This line is formulated for normal skins. Based on rare Swiss Alpine Edelweiss flower. Protects, Nourishes and Stimulates. Gives a Radiant and Smooth Skin. Inspired by their Alpine environment Helenere has developed Hedelweiss, an all-natural line based on the rich and particular flora of this region such as Edelweiss. Edelweiss extracts in skincare products have the exceptional property of neutralizing free radicals, thus preventing the appearance of wrinkles, related to the ageing process of the skin. The regular use of the products will definitely enhance your skin's well-being and looks, naturally. "Moisture" is the foremost important property I look for when picking skincare for the last month(s). This 24H Cream is primarily a moisturizing cream, not wrinkle-fighting, spot-erasing, oil-controlling, just mainly moisturising. The Edelweiss inside also helps with anti-oxidizing, but really, I find it to be a good basic moisturiser that delivers. With so many creams out there in the market nowadays, it can be tricky to find a simple cream to moisturise. 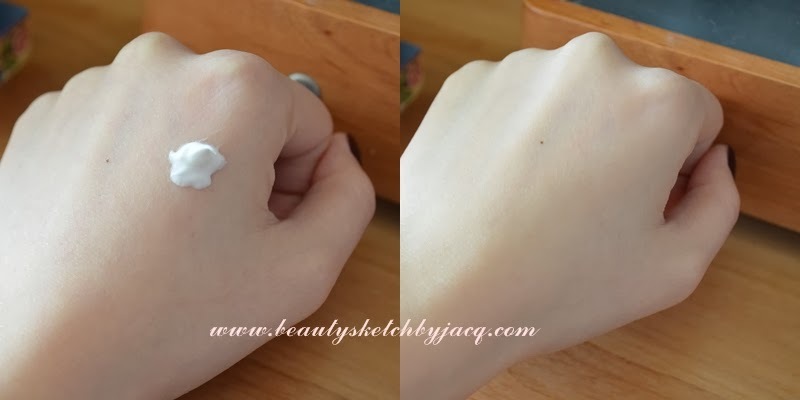 The consistency of the 24H Cream is not heavy. It is creamy with a bit of thickness. Once touching the skin, I feel it hydrates almost instantly and absorbs nicely. As I mentioned in the beginning, many of the times I just take a generous amount, throw it onto my cleansed face, and head to bed. More often though, I do the normal cleanse and tone, eye cream and face serum, then apply this as the last step. I use this morning and night. All Hedelweiss products are scented with a floral fragrance. I can tell because I have the entire line. The intensity of the fragrance varies among different products, and the notes are not entirely the same. Also, if you wish to use this in the daytime, make sure to follow up with sun protection in the form of sunblock or make up, as this cream doesn't state sun protection factor. I like it enough to have consumed 1/3 jar in about two months time. 1. Although it has the distinct fragrance of Hedelweiss line, in this cream it is presented softly and non-offensively. I enjoy the smell of it during application and while it lasted. 2. The sturdy classy glass jar, hygienic seal and handy spatula. 3. Skin feels moisturised and soft. Some products leave you a bit tight (firming?) or greasy (nourished?) after they sink in. This 24H Cream just leaves my skin supple and soft and lovely to touch and look at. 4. Make up can be applied on top, without crumbling up or melting down. Local distributor Colourmix (which may ship internationally, link: http://www.colourmix-cosmetics.com/) which has stores everywhere in the city. Alternatively, you may get it online directly from Helenere (link: http://shop.helenere.co.uk/hedelweiss/38-hedelweiss-24h-cream.html). There is a very helpful chat function for you to ask them questions, whether it is on products or sales/shipping. ingredients. and if someone is reading this caption, may I express how angry (?) I was when I read a blog post by someone else, claiming she's the first person to receive and review certain skin care, and posting a first impression instead of an in-depth review to repay that company!? *Product provided by company. I'm not paid to review it.